The Winchester Mystery House is a mansion located in San Jose, California. Now a famous tourist attraction, the mansion was once home to Sarah Winchester, widow to William Winchester, heir of the Winchester Repeating Arms Company. Said to have been haunted by the ghosts of those killed by the Winchester rifle, Sarah Winchester began the house’s construction in the late 1800s. Construction continued over the course of 38 years, day in and day out. To appease these spirits, she was determined to build a house that would never be completed. On the surface this is a typical Victorian style mansion. However, one soon discovers that this is no ordinary mansion at all. The house is a maze of rooms filled with architectural oddities. Some stairs have seven steps going down and eleven steps going up. The “Switchback Staircase” rises about nine feet but has seven flights with forty-four steps, each of which are only two inches high. 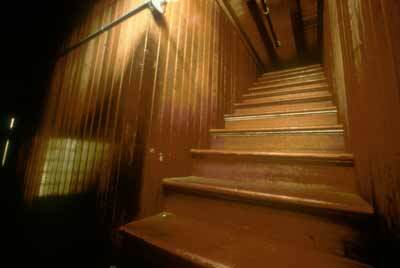 The most famous stairs lead to nowhere, stretching until they reach the ceiling. These never-ending stairs, inside a never-ending house, provide a series of questions about Sarah Winchester’s motivations without any concrete answers. When we think of stairwells, we think about traveling point A to point B. From destination to destination. We expect the staircase to act as a bridge. In dreams, stairs symbolize conclusions. The starting point is reality, the end point is higher consciousness. So what does it mean when there is no upstairs? What does it mean to pursue something, as Sarah Winchester did, without an end? Unable to put to words answers to these questions, I turned to Albert, a wise good old friend, who explained very eloquently that at the end of the day the pursuit itself has meaning. Many pursuits (such as science research) never arrive at a conclusion but instead make small contributions to the world. Perhaps that old saying about focusing on the journey instead of the destination is worth pondering more often in our lives. Jane is a life investigator currently based in New Haven trying to find a way to merge art and science.